Bankers of York, from the Ordinances of their Guild, 1595-96. A guild (also spelled "gild") is an association of craftspeople who have banded together for the mutual protection of their professional interests. Guilds were often very important in local economies, maintaining product quality and industry standards. There could be, however, a negative side: guilds often sought to establish monopolies, which could allow them to control local governments, giving guild leaders an often inordinate amount of power that could be abused. Like many institutions at the time (and since), Guilds were divided into hierarchies with Masters at the top, Journeymen in the middle, and Apprentices at the bottom. 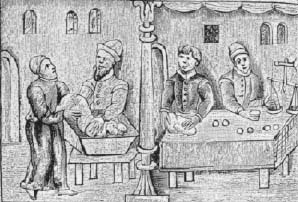 When in his early or mid teens, a boy would often be apprenticed to a Master who would be paid by the boy's family to care for him and educate him in his trade. After seven or eight years, the boy, then a young man, would graduate to the rank of Journeyman. Journeymen were paid for their work, and were allowed to work for any Master. After a Journeyman acquired sufficient experience he would create a "masterpiece," this work would be judged by other Masters within his guild, and if he passed their scrutiny he too would become a Master. Apprentices were expected to know their place, and could be punished if they stepped out of it... At a 1561 Christmas celebration, a young apprentice was found strutting about in clothes befitting someone who has already succeeded in life. He was consequently fined for celebrating in ruffs and a silk hat. More on the "sumptuary" laws that said who could wear what. The amount of freedom that Apprentices were given varied, and depended upon the rules imposed by each master, but many Apprentices and other young people were allowed to leave the house, sometimes in mixed company, for recreation or business. Recreational activities could include walking around town in the Elizabethan equivalent of cruising, loitering in front of various businesses, frequenting ale-houses and even brothels, and attending plays. divers journeymen and other servants in this company have heretofore [been] accustomed on the Thursday and other weekdays to go abroad to gaming houses, taverns, plays, and other such places where they oftentimes fall into ill company very dangerous and hurtful to them. In which their going abroad many of them have not only very unthriftily lost and spent their own money. . . but also very lewdly have lost and consumed away their masters' money committed to their charge.